I created a very simple template to start plugging some of these lists into a more scrapbook-y format. I love this concept of documentation. Make a list of verbs. Flesh them out with a sentence or two. Document the present. Just like that. DESIGN BREAKDOWN: First things first. White card stock background. Cue choir of angels. Thank you. The balance of this layout is essentially asymmetrical. You have a narrow column of photos paired with a journal block that is not quite two times wider. Rather than having a suggested line right down the middle, this page balance is shifted a bit off center, even though the content itself fills the space with an equal margin from side to side, and from top to bottom. This more even framing space around the core content actually lends a slightly symmetrical feel to the design, but the core is asymmetrical. We have lovely repetition. The photo sizes and the black and white repeats. 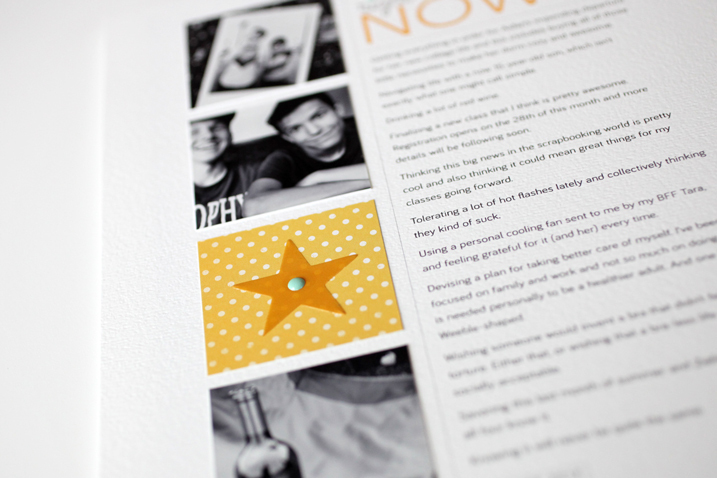 The mustard color from the patterned paper and plastic star shape, plus we have the two little enamel dots repeating. In fact, I think this is my favorite little touch. Do you ever have moments when you’re making a page that feels like a bonafide mic drop moment? Repeating the little dots and using one to dot the letter ‘i’ in the word right? That was mine. Again, what does repetition serve? It adds to the unity of the design. It gives the eye little dots to connect. Here, enamel dots, literally. There is a great quote from Antoine de Saint-Exupery about simplicity in design. It reads: “A designer knows he has achieved perfection not when there is nothing left to add, but when there is nothing left to take away.” I’m not saying this is perfection in design, but sometimes it does take some thought to figure out what is needed and what can be left out. But that could be said of a great many things in life, no? Another design convention is the generous use of leading and paragraph spacing*. Leading is the space between lines and it really does make or break the readability of any block of text. On this page, the type size is 10 points and the leading is set to 16.6 points. When you first start typing out of the gate in most programs, Word included, your leading is set to Auto, sometimes this is also called being set solid. The standard solid leading formula is to have your leading 2 points bigger than your type size. This is fine for things like books and magazines, but usually, a few more points of leading, even just one or two, can make a dramatic difference in readability. Another thing that helps? If you have a big chunk of journaling like I do here, make sure that the line widths are not overbearing. My journal block is just over three inches wide. When line lengths get too wide, they are harder for our eyes to track and read. And the last tip for your journaling? Align it left with a ragged right edge. This, too, makes for easier reading than if you try to force justify your text to fit the text box. Whew! Get me talking about typesetting and I could go one all day! *Paragraph spacing is the way I like to offset little paragraphs of writing, rather than include a full return space. Both Photoshop and Word allow you to customize this type of spacing. Photoshop Elements does not, at least I haven’t figured out how to do it yet. That said, when I design my templates and include paragraph spacing, it usually preserves that setting, even while working in Photoshop Elements. Just for fun, here’s a little tutorial on using leading and yes, I’ve included how to do this in Word as I’ve had a few requests to do so. Enjoy! Typography Lessons: The Ladies Love Leading from Cathy Zielske on Vimeo. Questions? Comments? By all means, fire away. Wanted to tell you how much I love your new site and how much I love the return of Make a Page Monday. I am conquering years of Photoshop phobia; buying your template each week and making one or more pages from them every week. Something seems to have finally clicked and they are quick and fabulous. Thank you, thank you, thank you. Hope it remains a feature of the site. Good luck with the coming month. Well Delia, that is awesome! And yes, I am going to work to keep this as part of the site. I may even pull out older pages that might fit for this column as well! I can’t tell you how much I’ve learned about design from you. Not only from your classes but from reading your blog. I’ve even passed my design knowledge along to my oldest – a graphic design major – while she was in school. I think she may have been just a little impressed! I am loving your Make a Page Monday’s!!!! Your design tips for the clean and simple approach are fabulous. Thank you so much. 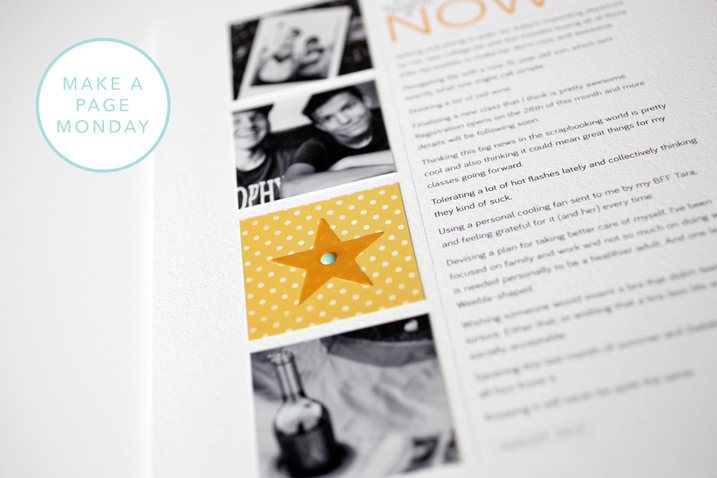 loving the Make a Page Mondays! Hold the Cmd key while dragging to avoid the annoying snapping behavior in Word?! Man, how many curses you could have saved me from uttering over the past fifteen years? Thank you for always having these little nuggets of greatness that make design easier…and more attractive. Yeah, I discovered that by accident once. I used to include Word in my classes but have since stopped. But that doesn’t mean I can’t keep sharing tips here! Love adding you into my Monday morning. Thanks for today’s leading lesson and bit of typography history. Love this page! I took your one of your classes and since then, I’m always adjusting my leading in PSE… umm, I can’t say if I’m doing it correctly per se, but I like tweaking it until it’s more visually appealing. And I’ve become slightly obsessed with Grand Hotel lately. Would you use it with a serif font? 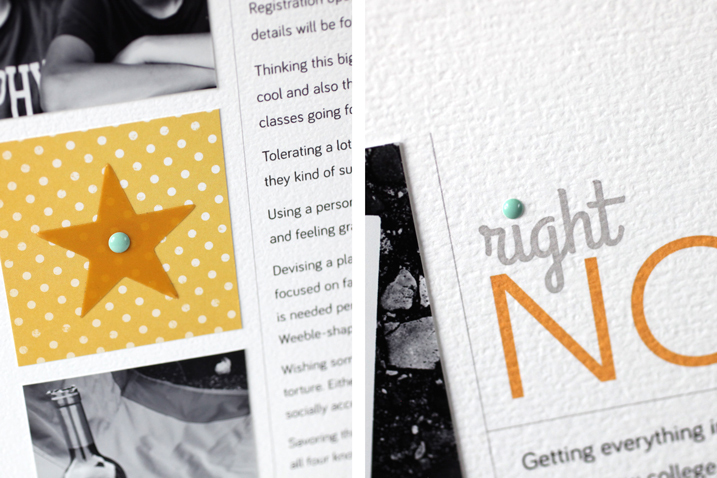 I tried with a few sans serif and just can’t seem to get a look I like on an invite. Maybe i’ll give Bariol a try as well. The reason I like pairing Grand Hotel with a sans serif is because of how very different it is. It creates such a nice contrast and visual tension. 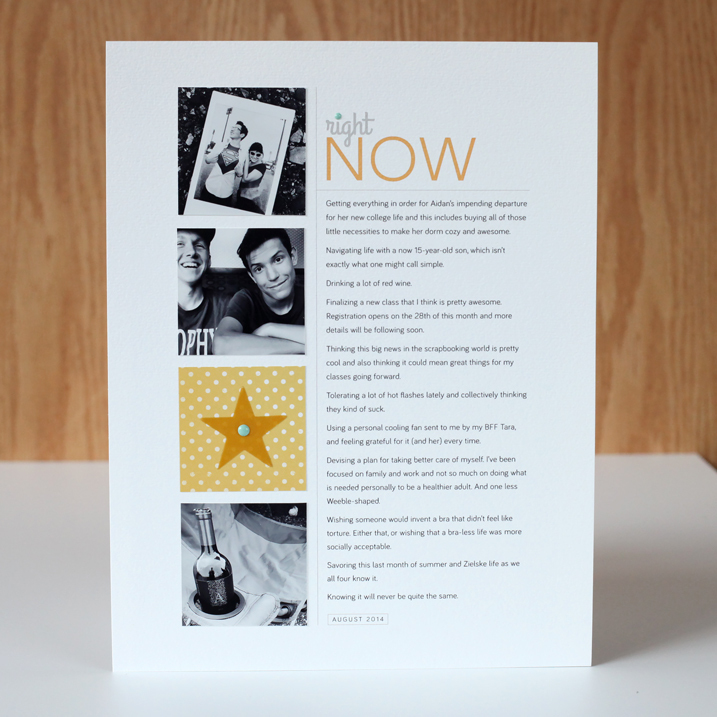 But I don’t use a lot of serif type in my scrapbooking. I actually would like to branch out a bit more. Sometimes, I feel like scripts fonts and serifs can blend a bit because serifs have their personalities too. But it’s all a matter of degree and there is no rule that says you can’t combine Grand Hotel and a serif you like! Love not only the explanation but the visual of where the word leading came from. 🙂 Thanks for showing this concept in Word as well as PSE — I use Word for my journaling a lot and the line spacing has always bugged me because I wasn’t happy with either 1, 1.5, or double lines. Now I’m free, free, free to go wild and crazy with 16.66, etc. Happy Monday. Great layout. I’ve been following your lead and creating a ‘present participle’ list for the last few months but haven’t really done anything with those lists yet. When I get home from work tonight I’m planning to buy that template and create a quick layout. Thanks for your continued inspiration and great products. I’m glad that you’ve restarted your Make a Page Monday. I love it. Cathy, in order for me to download and use this template, I have to have Photoshop on my computer? Or can I download it and use it in Word? Thanks! Your pages are absolutely my style! Leslie, unfortunately, they are not for Word. 🙂 You need Photoshop Elements or Photoshop to use them. Of course, Photoshop Elements is much more affordable. Under $100 and often you can find coupons and deals online and get it for a good price! Beautiful page! I know about your use of the textured background paper but was wondering about whether you prefer the photos (I assume on photo paper) to be matte or glossy. I thought I liked matte but sometimes they look flat. Recently, in a pinch, I needed some quick prints from Walgreens in glossy (their only one-hour option). They popped. I’m imagining you may need matte for photographing for the web…? As a designer, are there instances to use one or the other? I’m so behind the times! Is there some way to easily pin these? We are in the middle of a remodel and I feel Iike I’m missing out on all the fun! Okay, I installed a plug in! If you hover over any photo, you’ll see a little Pin It button. Pin away! Actually, hold tight! I’m working to make it work! And there’s a button now if you hover over images. We’ll try that for a while. Quinna, I’m working on figuring that out now. I know you can add a Pin It bookmarklet to your browser, and then any site or page you see you can click it and it will pin, but… i’ll try to get a pin it on my site posts! I love your new site. I love Make a Page Monday. I love that you work at your job. (Sometimes I feel like people are just phoning it in.) I love that you don’t assume that we just all know how to do these things. (Yes, even if you told us once, the computer learning curve is VERY big for some of us.) I love that you actually take the time to SHOW us how to do things. I love that I now recognize a hot mess when I see one. I love taking the crap out of scrapbooking. Honestly, there’s so MUCH crap, isn’t there? I notice the attention you give to people. I’ve loved the classes I’ve taken from you. I just wanted to say, “Thanks.” And to let you know that I notice the details and appreciate them. I was afraid you’d say that! I love writing, but editing makes me want to poke my eyes out with a sharp red pen! Really looking forward to the class 🙂 Thanks for the reply! Thank you so much for doing a word version!! rarely do I find one so I feel so left out having not ventured into the PSE world yet..
You are welcome, Kim! I know enough about Word to be dangerous! New class?!? I’m on pins and needles! Thanks for the awesome video! Your explanation is perfect! BTW- love the site re-design.